I feel one of the reasons The Great British Bake-Off is as popular as it is is because it provides a sense of stability to the nation. 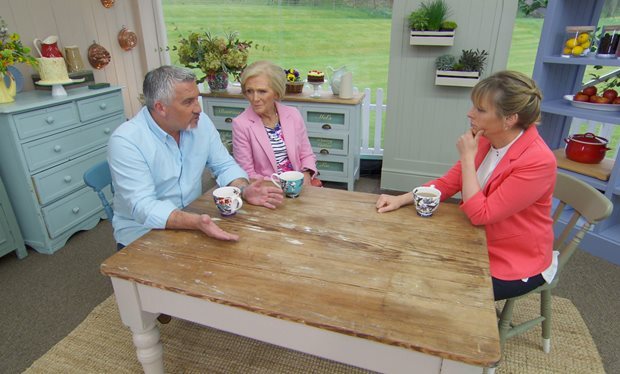 Every week you can expect smiles from Mary Berry, a few scowls from Paul Hollywood and witty exchanges between Mel and Sue. However a little bit of that stability was absent from this week's instalment as Sue was not accompanying Mel during her time in the tent. Although her voice was heard throughout the episode, and she presented the returning history of food segment, Mel looked at a bit of a loose end without her buddy. It's okay though as we've learned Sue was absent due to a family bereavement and will be back next week but unfortunately one of our eleven remaining bakers won't be. This week's signature bake saw the contestants tasked with creating twenty-four uniform iced biscuits and whenever you hear the word uniform you know that the finished product of some of the bakers will be all over the shop. Mel made it clear that the biscuits had to be big enough to dunk in Paul's mug of tea which continued last week's dunking controversy. In fact dunking was the watch word of the episode as later we saw Sue attend a masterclass about the history of the great sport of biscuit dunking. Poor old Val was fighting an uphill battle this week as she created some rather uninspiring ice cream cones that represented some of her favourite tea time treats as a child. Other bakers were being more adventurous with Candice creating forty-eight biscuit so she could layer her two lots of salted caramel biscuits on top of one another. Meanwhile chilled-out chap Selasi flavoured his biscuits with scotch bonnet chillies which turned out not to be as overpowering as you'd imagine. Talking of interesting flavours, Tom was back at it this week and made a biscuit flavoured with tea and coffee that he hoped would finally pique the judges' interests. In fact the judges were so impressed with him that he earned the coveted Paul Hollywood handshake for his troubles. Selasi, Jane and Michael all earned plaudits for their biscuits whilst Louise's oddly-formed sheep were criticised. However my favourite part of the entire judging segment here was the way in which Mary Berry used the word informal as a full on insult. It appears to be a theme of this year's technical challenge that Mary and Paul want the bakers to create something that normal folks like us tend to buy down the shops. After last week's Jaffa Cake challenge this week it was all about Viennese Whirls with the eleven contestants tasked with making twelve of the iconic biscuits. Oddly a lot of bakers struggled with the piping most notably Rav who had to enlist Mel's help in order to help relieve the stiffness of his bag. Shockingly it was Selasi who struggled here producing crumbly whirls that tasted oily and left him down the bottom of the leader board. Meanwhile it was middle-of-the-table Kate who came out of nowhere to garner the number one spot over last week's star baker Jane. This to me was the part of the show that proved that the Bake-Off was something I could never do as I saw the artwork and engineering skill that was put into some of the 3D gingerbread structures that the bakers created. There was very rigid rules for this contest, the structures had to be 30cm high and had to include at least eight characters or objects. They also had to have personal meaning with some of the bakers recreating specific life events such as Michael's trip to see Santa in Lapland or Tom's haphazard trip up a mountain with his friend Pod. Others were vaguer such as Benjamina recreating a trip to New York or Selasi remembering fondly his family's church in his native Ghana. Winning the judges over finally was Candice whose insistence on going the extra mile finally paid off thanks to her pain-staking recreation of her family's pub. This was possibly my favourite bake of the entire series so far as there was so much detail from making a lime jelly to make the green of a pool table to creating a separate stick ginger cake to recreate the full of the pub carpet. Judging from the reception Mary and Paul gave to Candice we'll definitely see her rocking a new shade of lipstick on next week's show. For the second week Andrew created a great showstopper in which he was able to utilise his engineering techniques and constructed fifty-seven different elements to tell his story about punting down The Thames. Unfortunately both Val and Louise suffered disasters as their structures crumbled before they made it to Paul and Mary's table of judgement. I felt particularly bad for Louise who was trying to recreate her impending wedding to her partner and the fact that the gingerbread church crumbled doesn't bode well for her upcoming nuptials. Star Baker: A well-deserved win for Candice as the construction of that pub alone was astounding. Eliminated: I honestly thought that Val's time had come but it was Louise who did have disastrous week but I felt may have been given the benefit of the doubt. Innuendo of the Week: For ages I felt it would be all the interplay between Rav and Mel with the piping back during the technical challenge however the award ultimately goes to Candice's 'can you come and grab my jugs'. It Seemed Like a Good Idea at the Time: Candice making 48 biscuits during the Signature Bake meant that she ended up with some dodgy looking creations. One to Watch: Youngest baker Michael is still a little rough around the edges however he produced the best gingerbread during the showstopper and his beehives were thoroughly praised during the technical bake. Next to Go: Surely it's got to be Val next? Next Week: It's all about kneading to win the prize as we head into Bread Week.